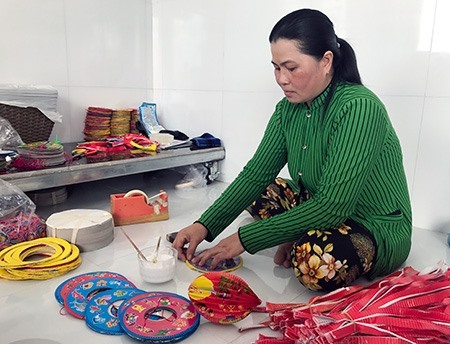 HẬU GIANG — Over the past eight years, Trần Thị Tuyết Minh and her husband Phạm Hữu Minh have not only set up stable work for themselves but also created jobs for many people in Vĩnh Thuận Đông Commune, Long Mỹ District in the southern province of Hậu Giang. Tuyết Minh’s and Hữu Minh’s lantern workshop has about 180 regular local employees, Tuổi trẻ (Youth) newspaper reports. When the mid-autumn festival comes, they hire several dozens more people. Some of them come from neighbouring provinces such as Kiên Giang and Sóc Trăng. About 30 of their employees are students, who work extra hours after school. And the remainder are old people, or workers who want to have extra work after their main working hours. The employee can receive VNĐ30,000-100,000 (US$1.3-4.3) per day each depending on their productivity. Tuyết Minh says that the work is very simple and do not need capital. Both old people and children can do it as long as they are hard-working. Anyone can do the work after being guided for several hours, says Tuyết Minh. Hữu Minh says that the workshop fills orders from different shops in HCM City. The lanterns made by the workshop have different shapes, colours and pictures, including cylinder, circle and cartoon characters. Hữu Minh delivers the products to shops every four days. Normally, he delivers about 7,000 lanterns on each trip. But from June until now, he has delivered more than 10,000 lanterns every four days to serve the coming mid-autumn festival, which falls on Monday. Minh says that many other shops in Hà Nội and HCM City wanted to order more, but he resigned himself to turning them down because he could not supply enough. “Local people are poor and it’s quite difficult to find a job, so my wife and I set up the workshop to help them,” says Hữu Minh. The work is not only simple, but also relaxing, so all can join in happily. “Thanks to the work, many students spend time helping their parents to earn some money, instead of playing or wandering after school time,” says Hữu Minh. Nguyễn Thị Trâm, one of the employees at the workshop, says that she and her husband work all day and night to finish the work to serve the mid-autumn festival. “The work is a little hard, but I’m happy because I have some more money for daily use,” says Trâm. Normally, Trâm’s family earns VNĐ150,000 ($6.5) per day, but when the mid-autumn festival comes, she earns VNĐ250,000 ($10) per day. Võ Thị Phương Hoa, a grade four student at the Vĩnh Thuận Đông 1 Primary School, says that after school, she makes paper lanterns to have fund for books and studying aids. On average, Hoa makes 60 lanterns per day and receives VNĐ30,000 ($1.3). “I’m very happy as I can help my grand parents,” says Hoa. Trần Đình Tuấn, chairman of the Vĩnh Thuận Đông Commune People’s Committee, says that Tuyết Minh’s and Hữu Minh’s workshop creates stable job for hundreds of workers in the commune and contributes to poverty reduction.